DETROIT — In a drugstore or grocery store line, tabloids are like fool’s gold, eye-catching and enticing and capable of duping the naive. Some of the stories seem so outrageous, so far fetched. Yet, we often glance at them and read the headlines. I’ve had first-hand experience with tabloids. Starting in 2001, I was one of the lead reporters at the Washington Post on the case involving Chandra Levy, the D.C. intern who disappeared and was having an affair with Congressman Gary Condit. Condit was a “person of interest” in the case and made for good fodder in the tabloids, though he was never charged. At the Post, we were forced to run down the flashy tabloid stories about the case and Condit. More often than not, they were totally false. The Globe story about Hoffa is just that: False and shameless. 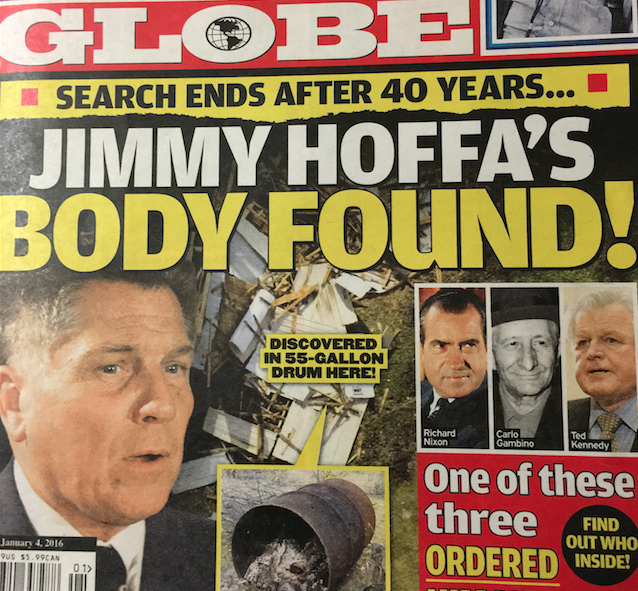 It’s pretty disgraceful that this trashy tabloid has published this story about the Hoffa disappearance and the whereabouts of his remains. Though no one has ever been charged, the FBI and investigative journalists have a pretty good idea that certain mob figures had a hand in the death to keep Hoffa from taking over the Teamsters again after serving time in prison. Before we go on, I asked the Detroit FBI to comment on the Globe story. One of the most baffling mysteries of the last 40 years – the shocking disappearance of union boss Jimmy Hoffa – has been solved! After vanishing in 1975, Hoffa has finally been found buried in a garbage dump, sealed in a barrel – and a bombshell Globe investigation reveals the Teamster kingpin was murdered on the orders of Sen. Ted Kennedy! The monumental discovery has been hushed up by the Justice Department. But a crack team of G-men unearthed a 55-gallon drum containing Hoff’s remains in a New Jersey dump shortly before Thanksgiving, confidential law enforcement sources reveals. The story goes on to say that Ted Kennedy ordered the killing to get revenge because he thought Hoffa was linked to the murder of brother Robert Kennedy in 1968. You might recall, a Jordanian citizen named Sirhan Sirhan was convicted in that killing. It seems the tabloids can’t resist exploiting the death of Hoffa, regardless of the truth. P.S. — Should you buy this issue, be sure to see the article on Pages 10-11 titled “I Was Hitler’s Flower Girl”. Posted: 1/5/16 at 9:37 AM under News Story.